Technology is ever changing and evolving, and with each new and exciting idea, there must be technology available or creatable to support it. Not all technology can survive the wheels of change, and being flexible enough to adapt is critical in these fast-moving times. The days of the carousel slide projector came to an end with the introduction of the digital projectors. Chalk boards gave way to white boards, which in turn made way for touch-based white board technology. These evolutions occur to make us more effective in our jobs, lessons, and presentations. They also manage both financial and opportunity costs to make us as efficient as we can possibly be. Today, we see another change occurring as Interactive LEDs are quickly taking over classrooms and boardrooms alike. The Interactive LEDs we see today are faster, more powerful, and less expensive to maintain throughout their long lifespans than the projector/touch-based whiteboard combinations we have all grown accustomed to in recent years. However, it is important to note that it is not only rapidly changing trends which lead to technological advancements, but competition as well. There are several different Interactive LEDs on the market, each competing with one another to bring the best possible product to you, the customer. TouchIT Technologies manufactures Interactive LEDs exclusively, and does so with our customers best interests at heart. However, we are not the only name in the game, and we know our competitors have some compelling products of their own. Which is why we would like to show you our products side-by-side with our competitors, so you can see for yourself why you should buy TouchIT over both Smart and Promethean in 2019. Smart Technologies is the natural place to begin, since their claim to fame is creating the first interactive white board in 1991. Pioneers in the touch-based technological field, this Canadian-based company recently celebrated 30 years of open doors in 2017 and celebrated with their nearly 800 employees. The year before , they were generously acquired by parent company Foxconn for around $200 million dollars (See Amanda Stephenson, Calgary Herald – https://calgaryherald.com/business/local-business/smart-technologies-to-be-acquired-by-chinas-foxconn-technology-group) Foxconn (also known as Hon Hai Precision Industry Co., Ltd.) is a Taiwanese multinational electronics contract manufacturing company and the world’s fourth-largest information technology company. Promethean is the second company we would like to focus on, as its interactive displays and software make them a capable competitor in the market. Founded in 1997 in the UK, this (now Seattle, WA based) company have been focused on advancing technology in the classroom for over 20 years, and have done so with their nearly 650 employees. However, unlike Smart and TouchIT, Promethean is new to the field of touch and gesture technology. They entered the foray in 2015 after purchasing the technology from Light Blue Optics in September 2015, just two months after themselves being purchased by their parent company NetDragon in July 2015 for around £84 million GBP. (See “NetDragon agrees to buy Promethean World”. Education Investor. 13 July 2015) NetDragon is a Chinese video game company founded in 1999 and is publicly traded on the Stock Exchange of Hong Kong. Now that we have a little bit of background on these organizations, we can confidently address their products (both hardware and software when applicable), their pricing strategies, the cost of ownership, and what kind of warranties they have available (if any). Then, we will look at TouchIT and see how we match up. Keeping in step with the previous section, Smart Technologies is where our analysis will begin. As we have discussed, Smart pioneered the interactive boards with their SMART board. Staying true to their roots, they still have three different models of interactive white boards in their product line. Their functionality is still quite limited when compared to the LEDs of today, for example they only have two-point and four-point touch available, and more obviously, there is still the issues of calibration and the blind spot from using the projector. They have one model (Smart Kapp) which for all intents and purposes is a regular white board that captures what you write and saves it to a subscription-based app on your phone. These interactive white boards were revolutionary in their time, but fall short of truly comparing to the LED’s of today’s market. Smart Technologies also offers four models of LED’s in their product line (three of which are interactive). Their sizes all range from 65”, 75”, and 86”, however it is not consistent across product styles. One model is 8-point touch, another is 10-point, and yet another is 16-point touch. Some models have control panels (function buttons on the unit), some models have remotes, some have tempered glass, but none of the models have very much consistency. They do come with 3-year warranties. The Smart software is broken down into two sections, one tailored for education (called the Smart Learning Suite) and one for Business/Government (called Meeting Pro and TeamWorks). The Smart Learning Suite is a platform in which teachers create and deliver lessons, use game-based activities, and allow for collaboration. It is a subscription-based service, which means you must pay an annual rate for access to the software. The same goes for the business software, which are each annotation and collaboration software respectively. These reoccurring costs should be calculated into future budgets if you decide to go with this product, because in order to access this software you will continue to pay each year you have the service. 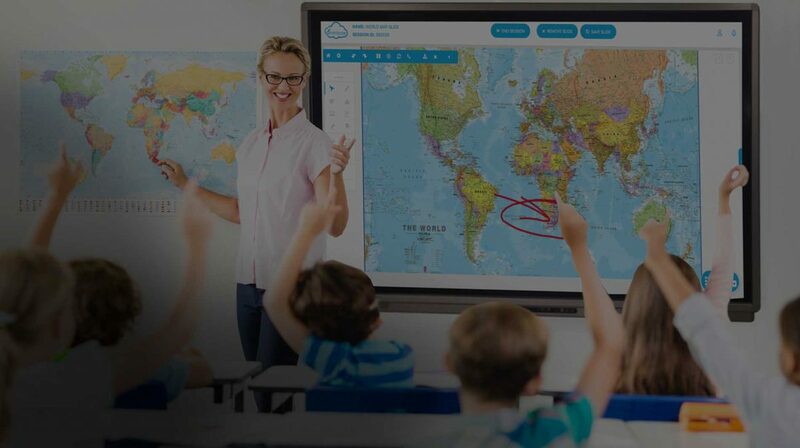 Promethean’s interactive display product line is somewhat like Smart’s in the regard that they offer different models for their displays as well as continuing to offer an interactive white board product. The white board model is a 10-point touch board available in 78” and 88” and comes with a 5-year warranty. They come with no sound or computational ability, however if you’d like those features (who wouldn’t?) you would need to buy them separately as accessories. There are also two interactive displays in Promethean’s product line, called the ActivePanel and the I-Series. These models vary quite a bit from each other (and their competition) in several ways. The ActivePanel is offered in four sizes to the I-series’ two, although not all the panel sizes are offered in 4K resolution. The I-series is unable to differentiate different styles of touch, and comes in 10-point touch to the ActivePanel’s 20-point. These models come with optional on-board android OPS (a feature which comes standard on TouchIT LEDs as well as complete 4K resolution technology). Both Promethean models come with Bluetooth and 3-year warranties. We have spent a lot of time discussing our competitors, their companies, their backgrounds, and their various products. For this final section, we will touch on who we are, how we are different, and why it is better. TouchIT Technologies is a privately owned, United States based (Austin, TX), interactive touch company. We have been in business for just about 10 years (Woo Hoo! ), and we employ under 50 employees, and have offices around the globe in Boston, London, Istanbul, and Montevideo. We’ve come a long way since starting out with our interactive whiteboards, and today we proudly offer the highest quality Interactive LED’s in 65”, 75”, and 86” inch models. The LED’s themselves utilize state of the art technology, including 4K resolution displays and built in Android operating systems. The operating system is fantastic, because this allows you to use the LED with or without your computer attached. You are able to use a web browser, download apps from our free TouchIT App Store, and access a variety of widgets with just a simple touch. Furthermore, all of our LED’s come with built in 10-watt speakers (a feature not available with many of our competitors’ products). Additionally, all of our LED’s are 10-point touch regardless of the size you choose. The same cannot be said for our competitors’ products. Finally, all of our LED models come with three-year on-site warranties (with options for 5-year warranties available). At this point, you may be wondering why we have moved away from producing and selling interactive white boards, or why you should choose our LED’s over our competitors whiteboard products in the first place? The answer is for two reasons: Performance and Price. The LED’s we produce today do so much more than the whiteboards ever could, especially with the addition of our Android operating system the whole experience is faster, crisper, and more user friendly than it’s ever been. There are no blind spots caused by standing in front of the projector while presenting, there are no more calibrations or concerns about the touch sensors not being perfectly tuned, and you can now save any lesson or whiteboard session you create with the touch of a button. The TouchIT 75” inch costs LESS THAN HALF as much as Smart Tech and 44% less than Promethean both of the same size. However, it is not only our competitor’s hardware that is expensive, but their software is too. As we discussed earlier, all of Smart’s software is “pay-to-play”, and in many cases they require you to buy a minimum one-year subscription of their MeetingPro software with every unit. Alternatively, you can buy their Learning Suite software (specifically tailored to classrooms) which costs you $109 USD per year, per teacher, with licensing restrictions on collaborative use (8 per session or 30 on the server). Smart’s software is costly from a performance side as well, being as they operate on a proprietary format opposed to the open format that we at TouchIT offer. This means that Smart software users are stuck with the service and often have little flexibility in getting away from it. An example of the way they do this, is when you build a presentation in their software, it has to be saved as an FCW file format specifically tailored to their programming (as opposed to a PDF file, or JPEG, or PPT, or DOCX). This makes it difficult (but not impossible! See our software below) to use outside of the Smart software format. These costs can certainly add up the longer you use them, making them far more expensive than what one might think at face value. At this point, as we’ve been discussing our competitors’ software, we’ve focused quite a bit on their shortcomings. Now, we would like to talk about our software and how it can be the most viable solution to your needs while overcoming the shortcomings of our competitors. We have our own cloud-based lesson creation, collaboration, and delivery software that we call Contribute Cloud. One of the best features of this software is that it is browser based, so there is absolutely nothing to install or upgrade as we take care of all of that ourselves! Another great feature is that it is cross platform compatible, which means it can be accessed and works effectively with Mac, PC, Chromebook, Linux, you name it! Yet another excellent feature, and one that really separates us from our competition, is that it is license free. This means there are no annual subscriptions, no reoccurring fees, and no limitations on how many devices you can use or be connected to! It is here that we also combine the whiteboard annotation feature that we’ve all grown to love with our state-of-the-art presentation, delivery, and collaboration platform. We even take the software one step further ahead of our competitors and bring multi-casting technology to your fingertips. How we do this, is a multi-faceted casting approach where the presenter (or teacher) can cast anything on her screen directly to the participants (or students) in real time! However, we don’t stop there. We also have allowed the presenter to cast each and every participant in the lecture or lesson up to our monitor for individual showcase, comparison, or collaborative purposes! With our file transfer feature, we allow the presenter and participants alike to send files to one another and chat with each other. At the end of the session, our software gives each participant the ability to save the whole presentation to their device with all their own annotations and notes preserved for later use. It is saved to a regular PDF file, not one of those pesky FCW files, so the user can access it easily and view/share it on any platform they wish. Speaking of those FCW files, our software is an open format, and we have specifically engineered it so you can take your Smart Tech presentations in their FCW formats and use them in our software as a part of your presentations. With Contribute Cloud, you are no longer beholden to costly proprietary software formats, and are free to create lessons and present them in whatever way best fits your needs. The last thing that we would like to discuss are the various resources TouchIT have available to support and train our customers. We strive to be as helpful and supportive with our products and services as possible. We do this because we know how difficult it can be keeping up with new and fast paced technological changes, particularly when education professionals have so little time for themselves as it is. Knowing this, we have done as much as we can to make the learning process about our products as easy as possible. One of the ways we do this is through our product tutorial videos available on our website. These videos show everything from what to do as soon as you open the box to final touches on your presentation with our software. The tutorials cover both the hardware and the software, and we encourage all our customers to use them. We also offer a simple system of product training through our website, where every day for 10 days we will send you an email and brief 5-minute task related to the LED or software. It is simply a different way we can help you learn the products without taking too much time out of your day. Our support system goes even further and allows us to personalize our training and support through webinars and on-site training sessions. When you contact us to set up a webinar, we will specifically tailor a training session to you through our knowledgeable team of technicians. Furthermore, our sales team travels all over the world organizing in-person demonstrations and support for all your needs. The same goes for our troubleshooting, and under our warranty if you experience any technical issues, we will send a technician to your location to resolve them. The final thing, and most important part of our support methodology, is that all our support services are free. We believe that happy customers result in positivity and longevity in our business, which is why we offer all this support and training to you at no additional cost. TouchIT Technologies' East Coast Regional Sales - I'm based in the field serving primarily customers in MA, CT, NY.